Touch screen capability is quite famous in today’s smartphone and tablet PC usage but it still lacks of one common feature – tactile response that can at least let users have a feel of how the typing experience goes. For instance, some may want to get similar tactile response on how precise they have tabbed on the specific keys especially for those that get used to hard keyboard and intend to switch to soft keyboard based devices. 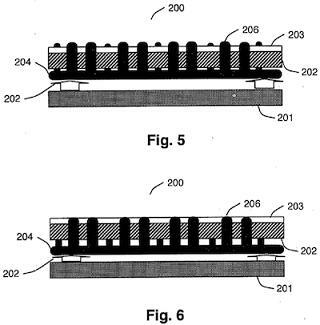 Just recently, Apple Inc has filed an innovative patent idea that features a dynamically changed surface with ability to give tactile feedback based on individual keystroke on touch screen with multi-touch capability. The touchscreen will be embedded with “articulating frame” that can define key edge and eventually provide tactile feedback based on the key regions. These key regions are created with physical dots as boundaries and would appear when the touch screen device is being used for typing. And whenever it is switched to pointing mode, the feature will disappear and change to smooth surface without interfering with how the device being used in normal mode. That is not all, the mechanism can also be configured to have concave depressions just like typical mechanical key caps on the surface. No exact date on when it will be available yet, but the technology is believed to be implemented in its upcoming tablet PC device that makes it an additional selling value targeted for greater user experience together with existing multi-touch capability.